Wine, religion, power, politics, money. From rich pinot noir to crisp chardonnay, Burgundy has long had a reputation for excellent wine varietals, and produces some of the world’s most expensive vintages. The region covers Beaujolais to the south, across the Côte d'Or and up to meet Dijon. There’s a lot of history in this soil, creating one of the world’s most fascinating vinicultural stories. Some speculate winemaking has been a part of the region as early as 600BC. Greek traders, well versed in wine production, travelled the Rhône Valley extensively, and the Celts may have grown vines before the Roman conquest. However, it was the Catholic church which really kickstarted the wine production that we know today. The first vineyard was donated to a church by the king in the 6th century. The Cîteaux abbey was built near Dijon in 1098, becoming the motherhouse for the Cistercian order of monks. They established a walled vineyard in 1336, the Clos de Vougeot. It was the largest in Burgundy. In these early days, becoming a monk was a wise career move, as you would have access to the best education in the country. For Cistercians especially, the stellar education was combined with a strong work ethic; they believed “work is prayer.” Combined, these two qualities made them revolutionary engineers, architects, artists and farmers. They also became expert winemakers. Wealthy landowners would donate parcels of land to the order so they could have their names entered into church books. The land was usually poor for regular crops and vegetable growing, but was shockingly ideal for vines. The monks had time to experiment and document their discoveries, developing their knowledge of winemaking. They sold their products in Beaune, becoming the first industrial wine producers. They were the first to discover the importance of terroir, recognising that certain areas produced more consistent wines. They were the ones who identified the region’s best fields, or crus, for growing: today the same Grand Crus designations are still in effect, with grapes grown in the best fields fetching the largest prices when bottled. The architecture of the early vineyards shows this religious influence. Clos de Vougeot is a fantastic example. The Cistercians believed God was light, so many of the rooms capitalise on the natural light. High, arched ceilings and large windows make the ancient presses feel more like a cathedral. The area surrounding the Clos is the largest grand crus vineyard in the Côte de Nuits. Burgundy was landlocked, and so in the early days the wines rarely left the region, and those that did would have to travel by waterways. However the efforts of the Cistercians were eventually rewarded: by the 14th century, wines from Beaune enjoyed a reputation as the best in the world. Philip the Bold, one of the Dukes of Burgundy, issued decrees to protect the wine’s quality. The Church and the Dukes held sway over the people; wine was one of their most important tools. Roads in France were much better by the 18th century, and wine commerce boomed. Burgundy’s fist négociant houses appeared, who amalgamated the produce of smaller winemakers and growers to sell under one name. Premier among the négociants was Joseph Drouhin. He set up in Beaune, storing his collection in parts of the ancient cellars that sprawled beneath the city. As his empire grew he acquired adjacent cellars to grow his storage. His son, Maurice, took over and purchased outstanding plots of land in Clos de Vougeot and Clos des Mouches. They became a vineyard domaine. Today, Maison Joseph Drouhin is still a family-run business, famed across the world. You can still explore their evocative, otherworldly cellars in Beaune. Pay careful attention for the remnants of false walls—they were erected during World War II, to keep the best bottles hidden from prying eyes. Burgundy became part of the Kingdom of France in the late 15th century, and the Church began to lose its influence. Vineyards were sold off to the bourgeoisie, losing all their land after the French revolution. The vines were parcelled off, passing down through family lines. The area was hit hard by economic depression, and then the war. The vines and soils had suffered, but growers poured their love and affection back into the land. By the mid 50s, yields were low, but the wines were some of the most stunning of the 20th century. The Confrérie des Chevaliers du Tastevin was established in the mid-30s, headquarters at Clos de Vougeot. To become a member was a great honour, joining the ranks of statesmen, military leaders, industrialists and great artists. They meet to celebrate many occasions; the spring, the summer, the roses, the equinox. They drink Burgundian wine and eat spectacularly, garbed to make the order look much more ancient than it is. They all wear a silver or pewter tastevin around their necks; a winemaker’s tool. The Chevaliers are succeeding. Burgundy wines are still considered some of the finest in the world. 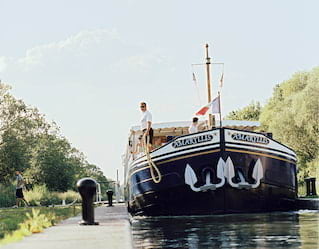 Discover the wonders of Burgundy’s wine in sensational style aboard Belmond Afloat in France. Travel through the region’s beautiful waterways aboard Belmond Fleur de Lys, Belmond Amaryllis or Belmond Hirondelle, visiting famous wine spots including the Joseph Drouhin cellars and the Clos de Vougeot. For the ultimate tour, opt for La Semaine des Grand Crus, sampling wines from all 33 Grand Crus domaines over seven incredible days.